Bodner has lived with diabetes for 47 years and IBS for 15 years. Though not a medical professional, he has spent his life studying medicine, keeping current with the latest published medical research papers, and has attained a strong understanding of how the body works and the causes of gastrointestinal disorders. Through his independent research over the course of more than 3 years, Bodner has hypothesized the root causes of this disorder and has now written a clear, easily understood book that explains how and why he feels IBS occurs, and how to treat it easily. 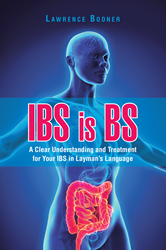 In “IBS is BS,” Bodner presents the biological process in relation to IBS using layman’s language, including real world analogies such as baking bread and car maintenance. Bodner recognizes that IBS is not a pleasant topic and many who have it choose to suffer in silence. It can also be linked to psychological conditions, as bodily functions are often affected by the brain and vice versa. However, having a better understanding of the condition by learning about the digestion process makes is possible to implement positive lifestyle changes and treatment. “IBS is BS” provides an honest examination of IBS that is accessible to people outside the medical field and offers a practical method of treatment for patients. Lawrence Bodner has suffered from IBS for 15 years. Through his extensive medical and scientific knowledge, he was able to understand the cause of IBS, how it manifests itself, and has devised an effective treatment solution. Bodner currently lives in Boca Raton, Florida.